The Ruby Collection is a stunning new resort concept encompassing four towers comprised of family-friendly apartments and villas with full kitchens and upscale amenities. 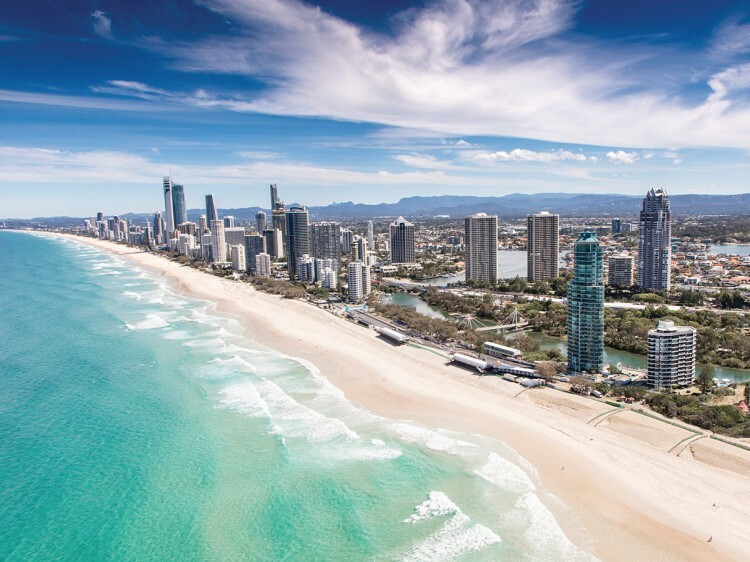 The first of its kind, the Gold Coast resort complex will bring to Surfers Paradise a multi-tower master planned community spanning an entire city block. With an emphasis on space and design, The Ruby Collection will feature beautifully finished apartments and sky suites with fresh and funky furnishings, spacious living areas, full kitchen and laundry, suitable for families of up to 8 to come together and enjoy all the comforts of home - plus a few extras. Awaiting outside your room is a swimming pool, children’s splash zone and waterpark, kids club, daily activities program and more to keep the younger ones entertained as well as a selection of dining and entertainment options for the adults which offers all guests a place to relax and unwind without ever having to leave. Whether you choose to relax on your holiday or get out and explore, The Ruby Collection Gold Coast strives to keep you entertained throughout your stay. 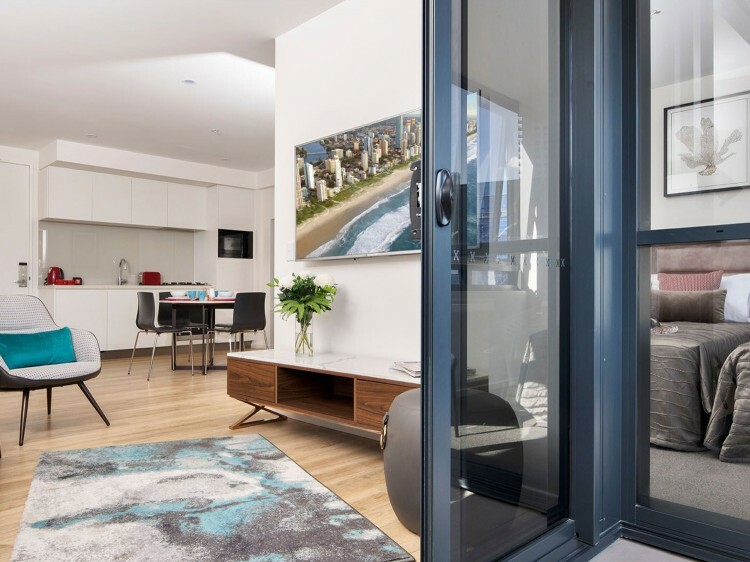 From a kids waterplay area to boutique bars for adults, the onsite offerings are what makes The Ruby Collection one of the best holiday apartments in Surfers Paradise. Stones Bar and Grill Restaurant - located on the ground floor, offering a social dining experience designed to bring friends and families together in a stylish yet comfortable setting. Featuring both indoor and alfresco style seating, the restaurant overlooks the landscaped terrace and pool area. The Terrace Cafe - whether it’s breakfast or brunch, lunch or dinner the Terrace Café is open daily from early morning until late evening with a delicious display to tempt all taste buds. Relax at a table on the terrace and watch the world go by or ‘grab and go’ with quick and convenient options to savour in the privacy of your apartment. Ruby Lounge Bar - serving handcrafted cocktails, ice cold beer and the finest of wines, the Lounge Bar is nestled on the ground floor overlooking the terrace and is surrounded by the comforts of the stylish yet relaxed living spaces. The Pantry - located on the ground floor for your convenience, stocking a range of locally and domestically sourced produce, including fresh fruit and veg, meats, cheese, snacks and all of your holiday essentials. And for the after-hours munchies you can access the mini-bar on demand from your in-room tablet or mobile phone and request delivery straight to your room. 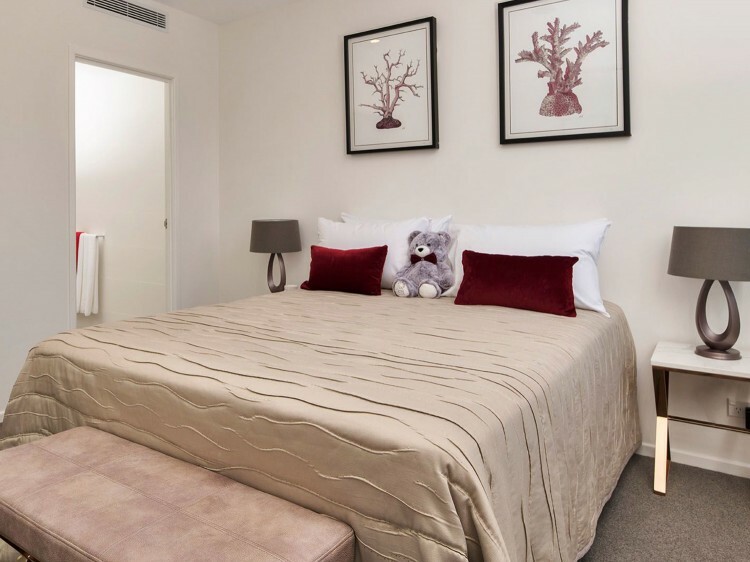 These spacious and stylishly designed apartments feature a queen bed, Hinterland views, balcony with table and chairs, a full kitchen, lounge and dining area, laundry, two smart TVs as little extras such as USB charging points, bluetooth speakers and complimentary WiFi all available in the main lounge. These spacious and stylishly designed apartments feature a queen bed, Ocean views, balcony with table and chairs, a full kitchen, lounge and dining area, laundry, two smart TVs as little extras such as USB charging points, bluetooth speakers and complimentary WiFi all available in the main lounge. Suitable for up to four guests with Hinterland views and two bathrooms, these apartments boast a queen bed in the master bedroom with a private ensuite and the choice of 2 singles or a queen in the 2nd bedroom as well as little extras such as USB charging points, bluetooth speakers and complimentary WiFi all available in the main lounge. A balcony with table and chairs, full kitchen, lounge and dining area, laundry, two smart TVs and second bathroom with bathtub and shower overhead. Suitable for up to four guests with Ocean views and two bathrooms, these apartments boast a queen bed in the master bedroom with a private ensuite and the choice of 2 singles or a queen in the 2nd bedroom as well as little extras such as USB charging points, bluetooth speakers and complimentary WiFi all available in the main lounge. A balcony with table and chairs, full kitchen, lounge and dining area, laundry, two smart TVs and second bathroom with bathtub and shower overhead. Suitable for up to seven guests, the modern and stylish suites are located on the 19-29th floors offering guaranteed birds eye views of the Gold Coast Hinterland and feature a master bedroom with a queen bed, a second bedroom with a queen or 2 single beds and a third Bedroom with a single bed and a set of single bunk beds. A balcony with table and chairs, a full kitchen, lounge and dining area, laundry, two smart TVs as little extras such as USB charging points, bluetooth speakers and complimentary WiFi all available in the main lounge. The third bedroom features children's theming with play desk and chairs. Suitable for up to seven guests, the modern and stylish suites are located on the 19-29th floors offering guaranteed birds eye views of the Ocean and feature a master bedroom with a queen bed, a second bedroom with a queen or 2 single beds and a third Bedroom with a single bed and a set of single bunk beds. A balcony with table and chairs, a full kitchen, lounge and dining area, laundry, two smart TVs as little extras such as USB charging points, bluetooth speakers and complimentary WiFi all available in the main lounge. The third bedroom features children's theming with play desk and chairs.